Active participation by all concerned companies, groups and individuals. Similarly, a singular focus on safety is insufficient. Children must learn to minimize risks but also learn appropriate and ethical behaviors in this digital world. In addition, they need an understanding of media literacy, in order to be able to think critically about the content they consume and increasingly create. Therefore, best practices must be part of a larger effort to provide an entertaining, educational, and safe experience for children. Provide information and tools that can vary by age and stage of the user. Continuously updated to reflect growth and change in the application or service. The task force then provided a detailed outline of the many tools and strategies that industries could use to accomplish these goals. I encourage you to check out the “Recommendations for Best Practices” section of the report for more detail since there are far too numerous to itemize here. As I will point out in a related post later, the “Point Smart. 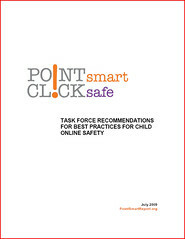 Click Safe.” working group’s findings and recommendation were very much in line with what 4 previous online safety task forces have concluded. Again, more on that later. For now, read this report!